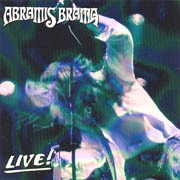 If you are a fan of Abramis Brama’s November influenced 70’s hard rock sound, then you will love this live CD. It was recorded at several locations and dates between December 2005 and June 2006. It is a good selection tracks from the bands studio CDs. It also includes an unreleased studio track as a bonus. I don’t know if it is the promo CD or not but the editing is quite sloppy with these 2 second gaps and the first track listed on the artwork is not actually on the CD. Well, played and well recorded with most versions of the songs performed quite close to the studio version. The band plays around and has a bit of jam on a couple of the tracks (Mjölk & Honning) as well as throws in a cover of Men mitt hjörta ska vara gjort av sten from November’s 2a LP (1972). Overall, quite an excellent selection of live Abramis Brama and a good starting point as well if you have not heard this excellent band.